Israel Air Force attacks three targets which serve as training and storage sites for weapons. The Israel Air Force on Wednesday night attacked three targets in Gaza belonging to the Hamas terrorist organization and which serve as training and storage sites for weapons. The IDF Spokesperson's Unit said that the airstrike was in retaliation for the rocket fire on communities in southern Israel on Wednesday evening. "The State of Israel will not allow any attempts to harm its citizens and will continue to protect them and its sovereignty in a sharp and decisive manner," the statement said. “The Hamas terrorist organization, which controls Gaza, leads the residents of Gaza to a life of poverty, destruction and despair, and is fully responsible for the situation,” it added. 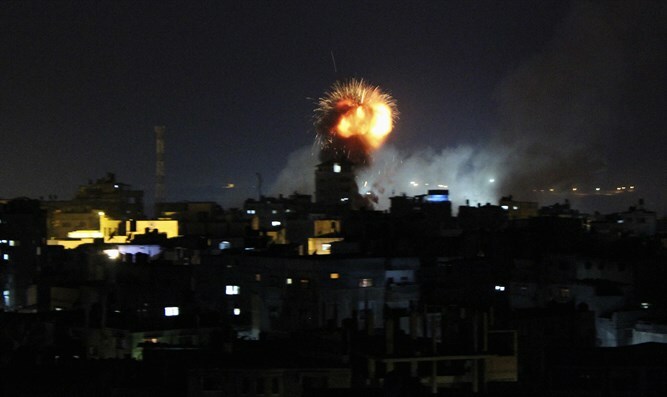 On Wednesday evening, at least three rockets were fired at Israeli territory from Gaza. The Iron Dome missile defense system intercepted two of the rockets. A third exploded in an open area in the Eshkol Regional Council. Several residents of Sderot were treated for shock following the rocket attack. Another man who suffered injuries when he fell while running to a shelter was treated as well. In the wake of the recent rocket attacks, Sderot Mayor Alon Davidi on Wednesday night urged the government to take action. "I expect the Prime Minister, the Defense Minister and the Chief of Staff to mercilessly strike the terror organizations. We will not tolerate continued firing at Sderot. Allowing rockets to ‘trickle’ is not a working plan,” said Davidi. At least 13 rockets have been fired at Israel from Gaza since U.S. President Donald Trump's announcement that he would recognize Jerusalem as the capital of Israel last Wednesday.